As the morning frosts turn to gently falling snow and frigid temperatures settle in, I yearn for days where we stay in, a fire crackling, wearing my coziest sweater with the dye pot simmering on the stove. As a maker, I am always looking for new ways to create, and this year I have fallen in love with natural dye. I love to gather dye materials from the woods or garden, eager to see what color they will create. Nothing beats the day you get to color your fabric or yarn and see the stunning new shade it produces. Natural dyes produce colors that are earthy, soft and so unique. I love the caramel-y shades of walnuts, purple-mauve shades of black raspberries, and the green-gray shades of lavender. The nature of natural dye is it takes a lot of time. It is a slow and steady process, each step taking time to yield the best color and result. There is no better time for this slow process than winter, as time seems to slow down as the temperatures drop and the soft hush of snow settles in. I have learned to love this slow process and look forward to creating many dye pots this winter. I decided to create dye from my garden's red onions, dyeing cloth napkins for our winter dinner table. I love growing onions each year, watching their bulbs swell and cover in their crisp, wafer-like skins. These vibrant colored skins are actually filled with dye potential, and don’t require a hike out into the snow to find them. This year I braided my small onion harvest, storing them in my basement cellar— a tiny space beneath the stairs where I store home-canned tomatoes, sauces and jams. This fall, after trimming each onion I saved the skins to create dye. 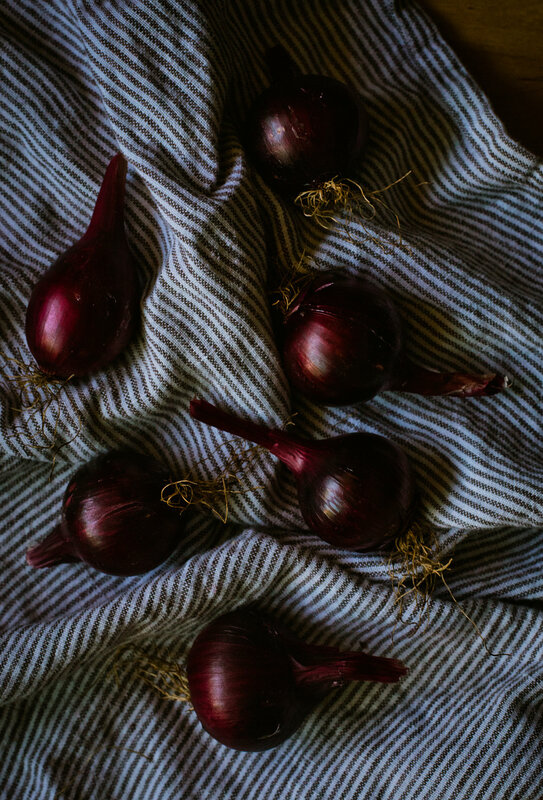 Red onions produce a range of warm tones, from soft pinks on cotton, to warm yellows on linen, to rich rusty reds on wool. I chose to dye cotton and linen blend napkins, to get a warm yellow– a perfect color for a winter dinner table. Red onion skins are perfect for your first natural dye project, as they do not require a mordanting step. Most dyes require you to soak your fabric in a mordanting solution to have the dye bond to the fabric. Onion dye naturally bonds to fabric, allowing you to skip this step. I am so excited to share my dyeing process with you. I hope you find a cold winter evening to stay in and make a pot of dye. *Reserve these items only for dye making. Never cook in a pot or use cooking utensils that have been used to make dye. Dye can be toxic to consume, so it should not come into contact with food. Start by peeling off the outer skin and cutting the ends off your onions. The outer skins are any part of the onion you do not eat, and some softer skins are ok. Place skins into your dye pot and add enough water to just cover the onion skins. You may need to submerge them with your hands to ensure you have enough water and not too much. Cover and heat over medium heat. Bring your dye pot to a slow simmer for one hour. After the hour, remove the pot from the heat and let it sit in a cool place for 1 to 2 nights. The longer you can let it sit, the more color you can extract from the onions. Strain out the onion skins by pouring your dye through a fine mesh strainer into a large bowl, mashing them with the wooden spoon to get all the dye out of the skins. Add your dye back to the pot to begin dyeing, or freeze for later use. It’s time for the magic to happen! Add your dye to your dye pot, heating over medium heat, warming the dye. Bring a large pot of water to boil, then add your napkins. Boil for two minutes. Using tongs, lift each napkin out of the boiling water and add them to the dye pot. Your napkins should be able to move freely in the pot, completely covered in dye. If they do not, add more water. This will not harm the dye pot or weaken it in any way. It will just disperse the dye particles a little more thinly. Let cook for one hour on med-low, not letting it boil or simmer. Remove pot from heat and let cool for one hour, or 1 to 2 days. I actually rinsed two of my napkins after an hour and the other two the next day to get a range of colors. The longer you can let the napkins sit in the dye, the more rich your color will be. It can also yield entirely different results! This part is so fun and worth playing with how long you let your napkins dye. When you are ready to wash your napkins, lift them out of the dye and place them in the sink and rinse until the water runs clear. Hand wash your napkins with a free and clear laundry detergent, rinse, then hang to dry. Do not discard your dye! It still has plenty of dye potential—it’s worth saving to dye anything from yarn for winter mittens to white cotton bandanas. Enjoy your napkins at your next winter dinner gathering. I love having people over in the winter. They come in cold and stiff, greeted by the warmth of a fire and smell of something rich and hearty cooking. Now the colored details of the table connect to the warm and rich experience of enjoying a winter meal together. Pass the potatoes please! This article appears in the 2018/19 Winter Issue. Buy yours here.